Running With Horses: GPS Art! 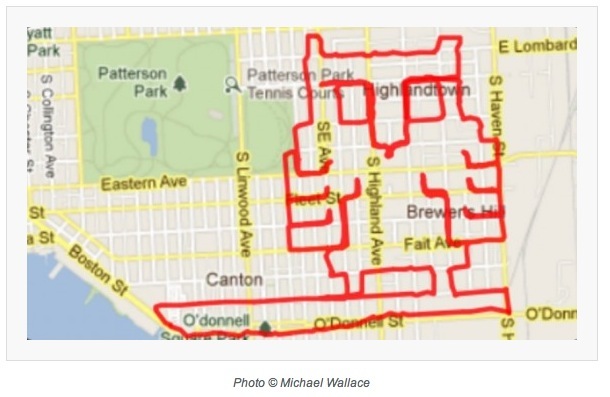 I recently read an article on a contest where runners submit their best Garmin "GPS Art." In others words, try to run a route in the shape of an object or the spelling of a word(s), then see how it looks on the downloaded route tracker. The samples were really creative and I imagine there are many miles that go into perfecting an award winning entry. 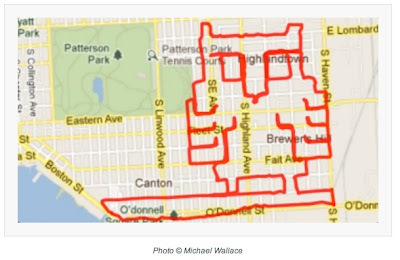 (see samples from a bicycle gps artist below). Anyway, that got me thinking; have I inadvertently "drawn" anything interesting from the hundreds of runs over the past few years? After searching the archives, I came up empty. However, I did recently complete a 6 mile run within a 1/4 sq mile area that not only looks pretty cool, but also demonstrates how you don't really need a set course, or a long distance path, to squeeze in a good run. I was staying next to a convention center while traveling on business, when I decided to see just how many miles I could get in by way of the parking lots. As you can see in the photo above, I looped up and down the parking spaces and around the facilities. The intent was to not repeat the same path from the same direction. I'm pretty sure I succeeded. It was a really enjoyable run and kept my mind occupied. By the way, I have also found that early morning shopping mall parking lots make great tracks. Give them a shot, and while you're at it, see if you can run it in the shape of an Auburn Tiger. Now that would be a winner for sure! great run through the parking lots! I'm always particularly amused by the GPS output from my track workouts. Just dozens of overlapping ovals. Thanks Miss REN&D! And to your track comment, I also always wonder what exactly happened when you have dozens of lines that are perfectly in sync with the track and there is a single lap that makes it appear the entire track shifted 50 yards in one direction? Just me?